Being at the forefront of creativity and excellence Cartier, on the occasion of the 25th edition of SIHH, revives the artisanal tradition of the Filigree, a craft that first appeared nearly 3,000 years ago, and gives this ancient technique a new life through the Ronde Louis Cartier Filigree watch, which features two panther heads woven in gold, platinum and diamond lace. Created in new Maison des Métiers d’Art at La Chaux-de-Fonds, the Ronde Louis Cartier Filigree watch reinvents the ancient art of filigree, a design technique used in Mesopotamia and which later appeared in Portugal, where the craft was perfected. As ethereal as lace, filigree is a goldsmith’s technique that entails using gold or silver wires that are twisted, coiled, or curled and then cut into small rings. The small rings are then attached to one another using solder, creating an openwork structure with the desired motif. When assembled, these elements are soldered on the sides but not at the base. For Cartier, the challenge was not only to adapt this age-old technique to the limited dimensions of a watch case, but also to enhance the craft by combining the sophistication of precious jewelry materials such as gold, platinum, and diamonds. 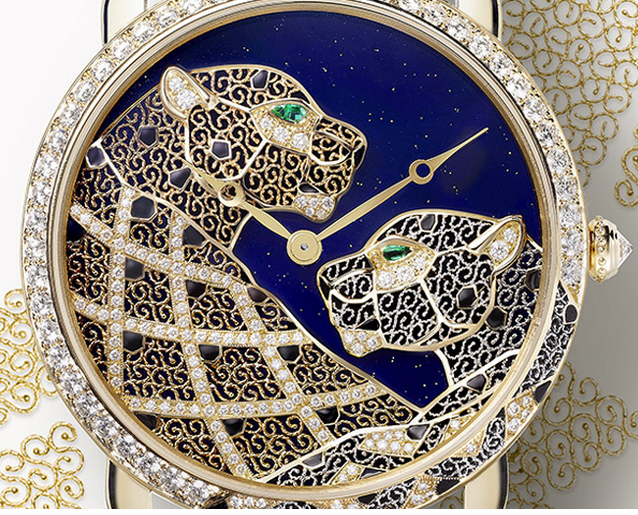 More than a month of work was needed to create this watch, which features a pair of panthers with coats of gold and platinum filigree adorned with black lacquer and diamonds. Draped in brocade with intense, gazing emerald eyes, these panthers are head-to-head in the poetic, fantasy-world contained within the watch’s precious diamond-paved center that is partly adorned with the motif. Yellow gold, brilliant-cut diamonds, crown set with a brilliant-cut diamond, filigree of yellow-gold and platinum wires forming a panther motif, dark blue lacquer. Eyes set with pear-shaped emeralds; spots and nose in black lacquer. Mechanical Manufacture movement with manual winding, Caliber 430 MC. Limited series of 20 individually numbered pieces. Post edited by Claudia Carletti, Jewellery Through Time. Material on Cartier website and on Rouge Cartier e-magazine.